Roam the wild plains and rocky crags of Africa under the expert guidance of your park ranger. Wildlife abounds as you tour the terrain in a rugged jeep and climb a rope ladder to the top branches of a multi-level tree. 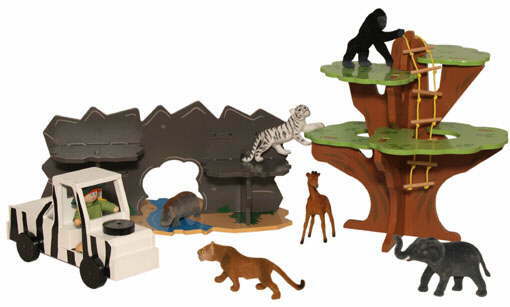 Part of our educational Natural Habitat Series, this set features 6 life-like animals and fun facts about their environment. The playset includes a zebra striped jeep with a driver.